Streetcars are one of multiple public transport options for cities to consider when investing in sustainable urban mobility. Photo by Sean Davis/Flickr. The Economist recently argued that streetcars are “a waste of money,” citing their high capital costs and inefficiencies as a means of transport. Others have argued that streetcars can be a catalyst for creating dynamic, vibrant urban environments. Both arguments hold some truth. Along with other forms of light rail – as well as metro and bus rapid transit (BRT) – streetcars can be a high-capacity transport option that improves urban mobility, quality of life, and the environment while providing an alternative to private vehicle use. In many instances, however, other forms of public transport may be more cost-effective investments. Cities should undertake comprehensive evaluations that consider the benefits and costs of each public transport system prior to their implementation. Streetcars have become increasingly common in the United States, with 23 existing systems and another 12 currently under construction. 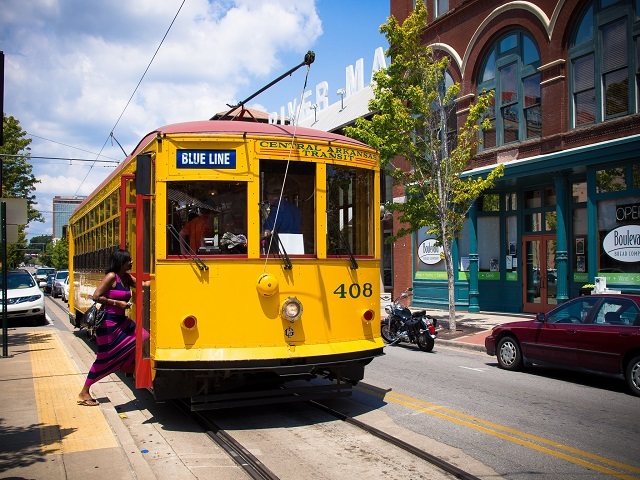 Though they typically travel more slowly and cover shorter distances than other forms of public transport, streetcars can help shape the identity of urban corridors and foster transit-oriented development (TOD). The Portland Streetcar, for example, only travels about six and a half miles per hour, yet it was able to trigger $2.3 billion in private investment due to the increased value of land with streetcar accessibility. Proponents of streetcars argue that they are more appealing than comparable bus services, and are thus better able to attract new riders and tourists. Some cities may not focus on integrating streetcars with the rest of the transport system, and will instead use streetcars as a placemaking tool for specific corridors. Europe’s streetcars, typically called trams, differ from their North American counterparts. These trams typically travel longer distances and are isolated from road traffic, making trips faster than those in the United States. Two of the most prominent alternatives to streetcars and light rail projects are bus rapid transit and metro. BRT is a bus-based mode of public transport that operates on exclusive right-of-way lanes. It is a relatively low cost, high-capacity transport option that is spreading rapidly to cities around the world. Originally developed in Latin America in the 1970s, 180 cities now have or are implementing BRT systems, a significant portion of which are in Latin America and Asia. Few high quality BRT systems exist in the United States, where only 360,000 passengers use BRT per day compared to 11,000,000 per day in Brazil. High quality BRT systems feature integrated stations, busways, and information technologies, and can reach relatively high speeds when using express services or fully separated lanes in expressways. BRT capital costs are 4 – 20 times lower than light rail systems, and 10 – 100 times lower than metro systems, with similar capacity and service level. Successful BRT systems can lead to significant economic development and time savings for users. In Istanbul, the typical Metrobüs passenger saves 52 minutes per day, while Mexico City stands to save $141 million in regained economic productivity as a result of travel time reductions from one BRT line. Similar to streetcars, BRT has the potential to generate significant transit-oriented development. For example, Cleveland’s HealthLine BRT generated $5.8 billion in investment, though the project only cost $168.4 million to construct. Unlike electric streetcars, however, BRT systems can be major producers of harmful particulate matter when clean buses and fuels are not used. Despite requiring huge capital costs, metro systems have the highest capacities and speeds of major public transport options. Metro systems are able to carry more than 30,000 passengers per direction per hour, and can allow business districts in large cities to continue growing, where service by road would be increasingly frustrated by congestion. Metros have relatively high distances between stations, and thus require bus or intermediate public transport services for last-mile connectivity. Currently, 187 cities have a metro system, and this number is set to grow. Metro systems exist in cities throughout the world, with the highest concentration in Europe, Eastern Asia, and the eastern part of the United States. They can be an important piece of sustainable mobility in populous cities, as 16 cities have metro systems with average daily ridership above 2 million passengers. Cities should consider the benefits and costs of each transport option based on the city’s specific context, budgets and objectives. High quality public transport can be used to reduce road congestion, provide environmental benefits, reduce travel time and costs, shape urban form, and support vulnerable and low-income populations. For each form of public transport discussed, governments should couple investments with zoning changes that increase density and promote mixed-use, transit-oriented development. By investing in the right mix of public transport options, cities can create a culture of sustainable mobility rather than one focused on car use. Dario Hidalgo also contributed to this post.